We are excited to announce Insane Amp’d is back and better than ever! 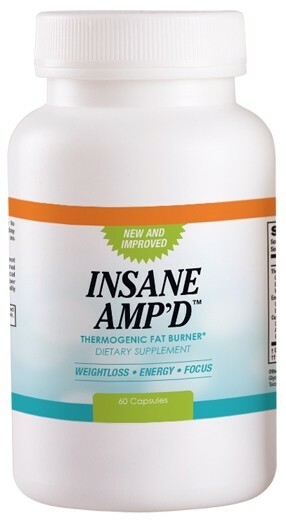 Insane Amp’d is our exclusive All-In-One Thermogenic Fat Burner designed to fire up your metabolism, decrease your appetite and curb sugar cravings, boost energy levels, help release toxins, enhance concentration and alertness. Our newly formulated bee pollen weight loss capsules will help accelerate fat loss, formulated in liquid capsules, Insane Amp’d has a rapid release of effective ingredients. Directions: As a dietary supplement, take 1 capsule to assess tolerance. For regular use take 2 capsules once a day on an empty stomach. Not suitable for: Not intended for persons under the age of 18. Do not use if pregnant or nursing. Consult a health care professional prior to consumption if you have any pre-existing medical conditions or are taking any prescription medication. Improper use of this product will not improve results and is potentially hazardous to a person's health. Use only as directed. Water Quality: Is Drinking Tap Water Safe? We will send you regular updates, coupons and deals. © Copyright 2014 by ANDS. All Rights Reserved.